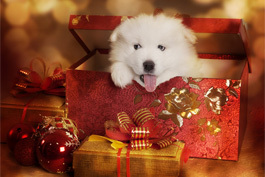 As we look forward to the festive season, it is sometimes easy to forget about our pet’s needs. 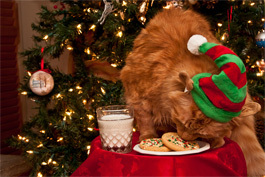 As wonderful as the house looks with all the decorations, and as tasty as all the Christmas treats are, unfortunately both can pose hazardous to our pets. As tempting as it may be to avoid waste, we would advise you against giving your pet any leftovers if you want to avoid ‘Turkey Tummy’. Not only will this cause diarrhoea (no-one really wants to have to clean up an additional mess on St Stephens morning…) but cooked bones can splinter and get lodged in your pet’s throat or intestinal tract. Our pets do much better sticking to their regular diet. That’s not to say they won’t beg when they smell the Christmas delights, but consider keeping them out of the kitchen when you are cooking and eating Christmas dinner. On that note, make sure your tree is well anchored! Your dog has eaten chocolate, what should you do? The toxicity of chocolate depends on the type – with white chocolate having very little theobromine in it and dry cocoa powder the most. Very roughly, for a 10kg terrier, we would expect to see a fatal toxic reaction if they had eaten 300g of milk chocolate, 150g dark chocolate, or 50g of baking chocolate. It is always best to err on the side of caution and contact us if you are at all concerned. There is no antidote to chocolate poisoning, but in most cases we attempt to make your dog vomit followed by supportive therapy such as intravenous fluids and medication as necessary to control heart rate, blood pressure and seizures. With prompt intervention and treatment even in dogs that have eaten large amounts of chocolate the prognosis is good. 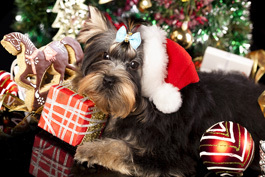 ‘Tis the season to be jolly… but our pets may not agree entirely with this. Christmas can be a stressful time for our pets, with new visitors to the house, a change of furniture to accommodate all the decorations, a flashing Christmas tree taking up the cosy corner of the living room, and all the new smells as we bring the delicious Christmas food into our homes. You know best how your pet responds to stress, and if you feel that he or she might struggle with this then you can make some adjustments in advance. Make sure you have a quiet, safe den that your pet can retreat to if it all becomes too much, and speak to us about natural stress relieving products like Adaptil or Feliway if you would like to try natural pheromone therapy for your dog or cat. These are either worn as a collar or used as a plug in diffuser, and they can help to calm anxious individuals without relying on drugs. If you are considering buying your loved one a pet this Christmas, please don’t do it on impulse. Research carefully, and remember that the cute fluffy bundles will grow up and cost money long after the initial ‘wow’ factor has passed. If you want to have a chat to us about pet ownership, the implications, the cost, preventative healthcare and choice of pet then please don’t hesitate to come in and see us. If you do get a new pet over Christmas we look forward to meeting him or her very soon. We offer free of charge ‘Cuddle Consults’ to let your little one get used to visiting the clinic before the vaccination course starts, just give us a call when you are ready to make the visit! 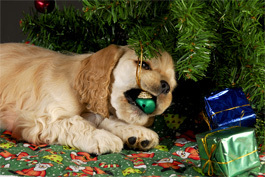 Merry Christmas and Happy New Year from us all at Ennis Veterinary Clinic! We wish you a wonderful festive season and all the best for 2017.